To calculate beam capacity, it’s a simple number. 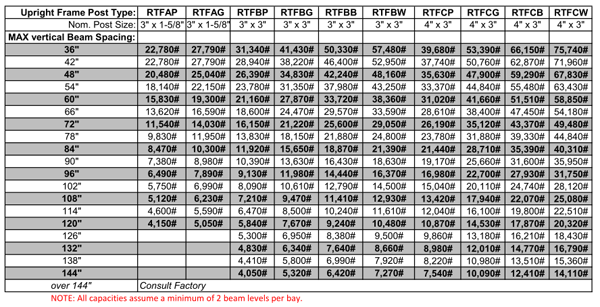 Almost any beam sold has a standard capacity per pair. To be clear, that means that this rack beam has 5,080 pounds capacity per level (two beams) not for each beam. There are rules for load distribution (it has to be evenly distributed), but essentially that’s a rather easily understood number. You can have two pallets of up to 2,540 pounds each on that beam level. Upright frames depend on the vertical space between beams, also called the “unsupported span”. 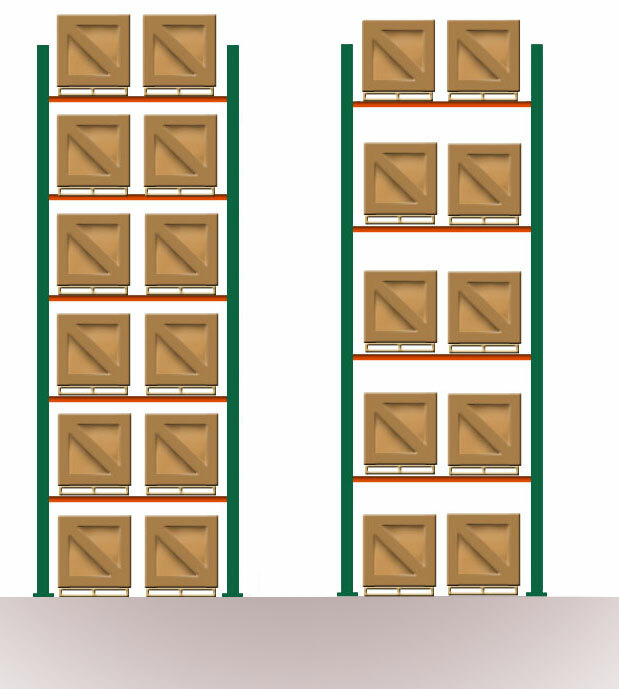 Essentially the more air between levels, the lower the capacity of the rack due to fewer beams, which act as horizontal ties between the uprights. This makes the rack structurally more stable and capable of holding more weight. So if you have a very tall, but light load, you could have larger unsupported spans between beam levels. For dense, very heavy loads, you need tighter beam spacing. In this drawing, the left rack bay can hold more than the right bay because it has more beams and less vertical space between them. All rack manufacturers post their upright capacity tables online, or provide them in printed form. The tables compare the type of upright to the vertical beam spacing, and tell you how much the frames can hold in total. This is pretty much independent of what the beams can hold, but will obviously need to be stout enough to carry fully loaded beams. Be sure your floor can bear the weight of the rack, plus the maximum load. People assume that their floor can, and sometimes that isn’t the case for very heavy loads. Your racks should always be connected to the floor to attain their listed capacities. They should also have correctly installed beams and connectors/safety clips. Frame (and beam) capacities are listed for static loads. The weights of your rack components counts against your capacity — deduct the weight of beams, frames, decking, and accessories. Choose an even greater capacity upright, for additional abuse resistance. Racks can be hit by forklifts, and a beefier upright is good protection from that (although certainly not foolproof). Very tall applications are tricky. Contact us for assistance on those. Seismic loads are a different standard. We recommend that you contact us, or another qualified rack vendor for any seismic zone application. Contact us for any application you aren’t sure about (our advice is free). 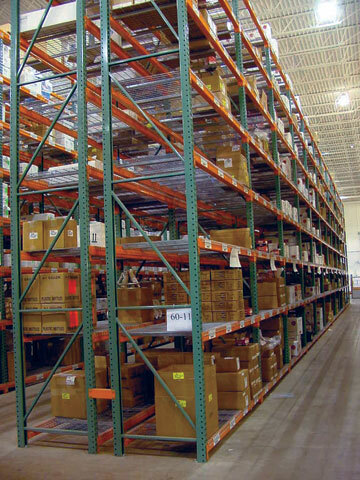 We offer an online pallet rack estimator, but it’s not suited to all sizes and styles of rack. It will return excellent general results for selective rack, but it isn’t going to be able to help you with higher capacity, taller, or trickier applications. All major manufacturers publish upright capacity tables that compare vertical beam spacing to the upright type. While a listing of every potential rack upright capacity table out there would take days to read, in general you can find these on manufacturer websites, or you can contact any rack vendor for assistance locating this information. You’ll need that table to compare to your situation for any rack installation. Contact us with any questions you have on rack configuration. We’re here to assist you.